Yummy, Low Calorie Diet Food -- Plus Where to Buy! : Do you like Mint? The chocolate flavored water tasted very fresh -- it was both chocolatey and minty, as one would expect. I actually think it might have tasted better without the strong mint flavor, although I got more used to the mint flavor as I drank more. 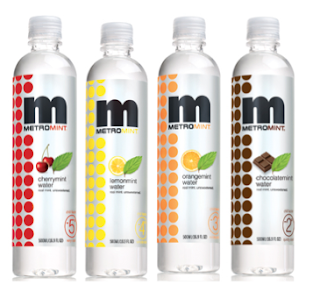 So, metromint water come in several flavors including, cherry mint, lemon mint, orange mint, peppermint and spearmint. I haven't yet tried the cherry mint flavor, but I'm very intrigued and will try it soon. The bottles each hold 16 ounces of water, so each one counts for 2 cups of your daily water intake. By the way, if you are looking for low calorie flavored water, I wanted to point towards some previous postings where I wrote about making your own fruity flavored water, Hint water, as well as 2 calorie fizzy vitamin tablets called Zenergize that you can add to your water. Can't imagine the cholacolate-mint mix of flavor in water! Have to try it soon! juliet, i drink one of these everyday!! my favorite flavor is the chocolate mint. im jealous of the cherry mint. they don't sell it where i live. when you try it, let me know how it is. have you seen the new water called Ayala's? that's very good, too. Joanna - I will check out Ayala! Where do I buy it? I love mint and would love to try these. They sound so interesting, specially the chocolate one!